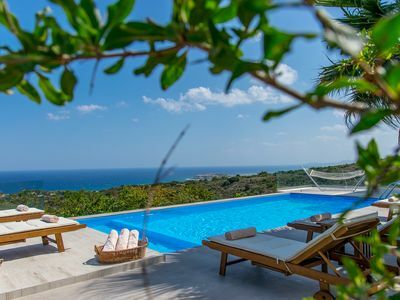 Villa Persephone is set on a 790 m² plot with great views of the sea and the White Mountains. 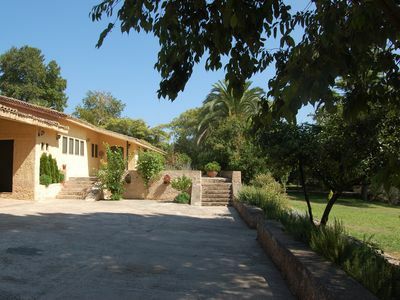 The villa has 3 bedrooms, 2 bathrooms, living room and a fully equipped kitchen and has a living area of ​​135 m². In a bedroom you can also provide a side bed. 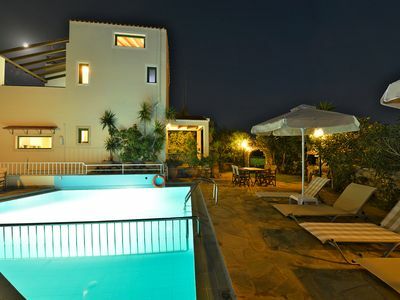 Thus, the Villa Persephone is suitable for 6 people and a toddler. 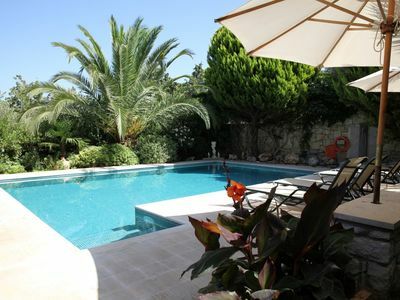 The house has been furnished with great attention to detail and guarantees a high level of living comfort. 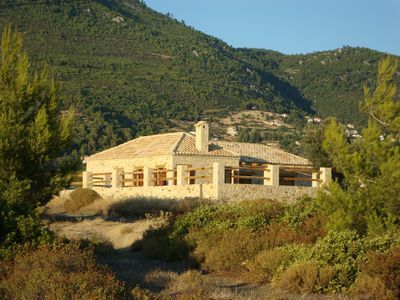 All rooms are fitted with beamed ceilings and stone walls and niches are integrated into the walls. 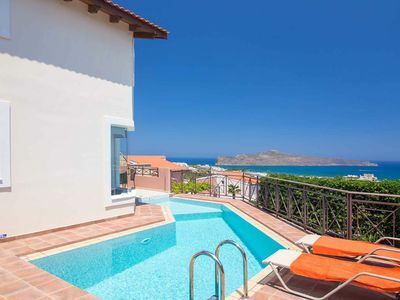 On the ground floor you will find a Cretan style fully equipped kitchen separated by an arch from the living room. 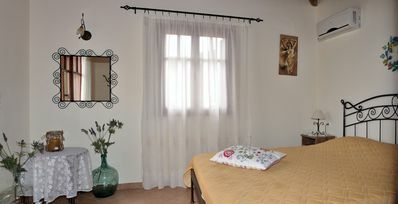 In addition, you will find a double bedroom and a twin bedroom and 1 nice bathroom with shower downstairs. The terrace is equipped with nice furniture. Upstairs there is another bathroom with corner bath and a bedroom with double bed. All bedrooms have shutters, mosquito nets on the windows and mini stereo system. There is a large roof terrace here. 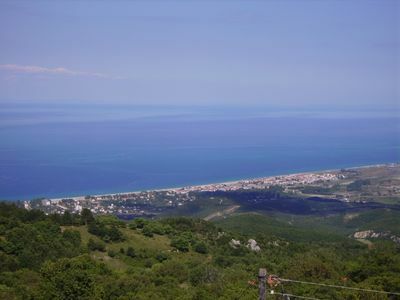 Enjoy the fantastic view of the sea, the White Mountains and the Akrotiri peninsula! 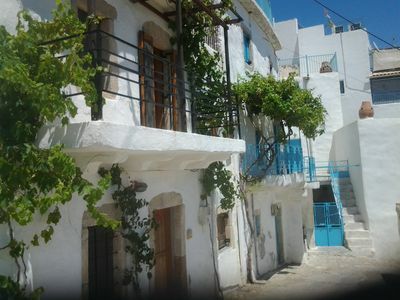 As a welcome gift we will provide you with a basket of fruit, a bottle of wine, juice, a liter of Cretan organic olive oil and a bottle of water. The entrance gate and the garage can be opened electrically with a remote control. The most important thing in brief: Living space: approx. 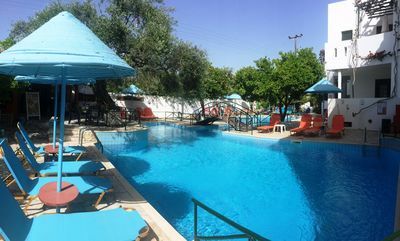 135 qm, land area: 790 qm, interior: central heating with underfloor heating, refrigerator, freezer, dishwasher, iron, electric cooker, washing machine plus dryer, ironing board, oven, microwave, hair dryer, coffee machine, 2 TVs, CD player, DVD player, stereo system, Internet via WLAN. Outside equipment: very nicely landscaped garden, upper terrace about 40 m², pool about 40 m², permanently installed barbecue, garden furniture, lower terrace 35 m² roofed (partly with brick, partly with glass), outdoor shower, technology: satellite system, many German channels, Hi-fi, CD player, 2 TVs, DVD player. Extras: electrically opening garage, open fireplace. Massages can be organized in the villa. 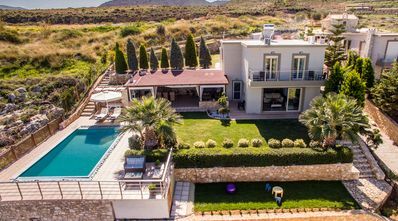 Villa Infinity with Sea Views 2 km from Rethymno city & Beach. Shaded BBQ area! 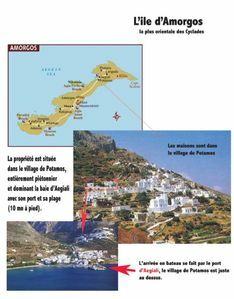 Lindos. 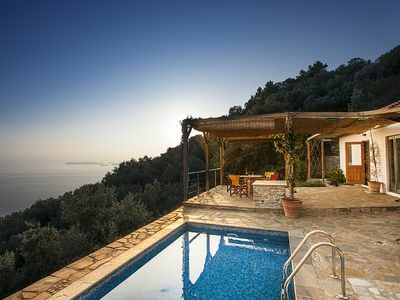 Stunning Views of The Aegean. Private Gardens and 10m Pool. Free AC.